Car owners Kevin and Lee Roy Rumley join Mike Marlar in victory lane. What won the race: Regaining the lead from Josh Richards on lap 22, Mike Marlar of Winfield, Tenn., led the rest of the way to win Monday’s DIRTcar Nationals opener at Volusia Speedway Park. Marlar, who took the lead on lap seven before surrendering it to Richards on lap 20, used an outside pass in turn four to sweep around Richards of Shinnston, W.Va., and Darrell Lanigan of Union, Ky., to take the lead for good. Key notes: DirtonDirt.com, in partnership with DirtVision, is providing live video coverage of all six Volusia events; find info and links in the upper righthand corner at DirtonDirt.com. 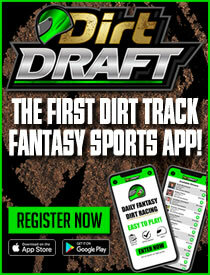 … The DIRTcar Nationals got rolling Feb. 5 with UMP DIRTcar modifieds and a practice for sprint cars. … The World of Outlaws will sanction four nights of Late Model racing at Volusia, which celebrates 51 years. ... Five races last year produced five winners: Jonathan Davenport, Tim McCreadie, Dale McDowell, Scott Bloomquist and Brandon Sheppard. … Billy Moyer is the all-time winningest DIRTcar Nationals winner with 19 career victories. On the move: Scott Bloomquist of Mooresburg, Tenn., started 18th and finished third. Winner's sponsors: Marlar’s K&L Enterprises Longhorn Chassis is powered by a Cornett Racing Engine and sponsored by Delk Equipment Sales, Mark Martin Timber & Farms and D&E Marine. Points chase: Rusty Schlenk of McClure, Ohio, is the reigning UMP DIRTcar weekly champion. BARBERVILLE, Fla. — When agreeing to drive for Kevin and Lee Roy Rumley’s revived race team this season, Mike Marlar knew the new pairing had plenty of potential. Just how soon the defending World of Outlaws Morton Buildings Late Model Series champion and the famed father and son duo could reach that potential, however, was the biggest question. Consider that question answered, quickly. Winning in just the third race of their partnership, the Winfield, Tenn., driver collected $7,000 Monday at Volusia Speedway Park, earning his first Gator trophy for his first career DIRTcar Nationals triumph. After leading laps seven through 19, Marlar regained the lead from Josh Richards of Shinnson, W.Va., on lap 22 of 30 and led the rest of the way in what was an entertaining opener for the 48th annual DIRTcar Nationals at Volusia. Darrell Lanigan of Union, Ky., finally got the upper hand of a lengthy tussle with Richards and muscled his way by to take second place. He chased Marlar over the waning laps but eventually settled for a runner-up finish after starting 12th. Scott Bloomquist of Mooresburg, Tenn., started 18th and rallied through the field to grab third ahead of Richards, who slipped to fourth late in the distance. Outside front row starter Chase Junghans of Manhattan, Kan., completed the top five after leading the first six laps. Junghans, seeking his first-ever DIRTcar Nationals victory, darted ahead of Richards on the opening lap and quickly stretched his lead to nearly half a straghtaway. Marlar zipped by Richards on lap three and wasted no time catching the leader, rolling by Junghans on the outside as the exited turn four to grab the point. It wasn’t the last time Marlar would use that tactic to take the lead. After allowing Richards to get by on lap 20 — just as Brian Shirley of Chatham, Ill., slowed to bring out the second caution — Marlar stepped to the outside following the restart and passed both Lanigan and Richards, getting around them to lead lap 22. “My car was almost too good to drive through that rubber,” said Marlar of the developing grove around the speedy half-mile oval. “I would hit that stuff and just push right out of it. My car had a lot of forward traction. So basically I knew if they were having to slow down enough down there getting in, I could get me a real good run and go around ‘em and get back in. Marlar, who’s driven a number of different chassis brands over the past decade, said he’s still learning in the seat of Rumley’s Longhorn Chassis. Over the final eight laps, Richards fell into a fierce battle with Lanigan, who grabbed the second spot after the two made contact. Lanigan voiced his displeasure in victory lane, adding that he thought he had a car good enough to win the race. His second-place finish was his best run in three races since leaving Clint Bowyer Racing and returning to his own equipment to start the season. Bloomquist, who started 18th after winning the second B-main to gain entry in the feature, said he was actually hampered by one of the three cautions. Notes: While thanking a bevy of people for playing a part in Monday’s victory, Mike Marlar was especially appreciative of former car owner Ronnie Delk. While the Tennessee businessman no longer owns his race car, he has helped Marlar and the Rumleys get going this season. “I gotta thank Ronnie Delk. Here he is, me and him decided we was gonna do some other things. We’re gonna do some things together, but outside of racing. When he found out that Kevin wanted to race, he was like, ‘Heck, I got a motor,’ and then a few days later, ‘just let him use our hauler,’ and all this stuff. So now Ronnie’s letting us use all this stuff,” said Marlar. … Marlar finished 1.272 seconds ahead of Lanigan. … Twenty-one of the 24 starters completed all 30 laps. … While Scott Bloomquist struggled in his heat, the Hall of Famer did get better as the night progressed. “We changed a number of things before the feature,” Bloomquist said. “(The car) had just been too tight all night and finally got it where it was pretty nice out there. We can still free it up a little more. We’ve got a good place to start for (Tuesday) anyway.” … Josh Richards said it simply took his car took long to get going after his tires cooled down. “I did not want to see that caution. It seemed like it took my car four or five laps to get going. It was just kinda easy out there. Once I got heat in my tires, I could really go, so I was just kinda a sittin' duck there on those couple of restarts,” said Richards. … Three cautions slowed the race. A caution waved on lap one when Brandon Sheppard got turned around in turns three and four. Officials docked Tanner English with the yellow and sent the Stone-Weaver Racing driver to the tail of the field. Brian Shirley slowed to bring out the caution on lap 20 and Ken Robinson slowed on lap 24 with a left front flat. … The night turned sour for fourth-starting Chris Madden early. Madden pitted during the lap-one caution to change a flat tire. He returned to the track and finished 15th and was never a factor. … With more than 50 cars on the grounds, Tuesday’s program should see a slight increase from the 42 entrants Monday’s race drew. Feature polesitter Josh Richards has 10 career DIRTcar Nationals victories — third on the event’s all-time win list — but his last triumph came in 2016. He captured three of the week’s six races that year. … Outside polesitter Chase Junghans has never won during the DIRTcar Nationals, but he said he’s confident he can change that before the end of the week. His strong performance at Volusia last year (he contended for victory in a fog-shortened World of Outlaws A-main) and strong start to 2019 Speedweeks (back-to-back top-fives at Screven Motor Speedway plus three other top-10 outings) give plenty of reason for optimism. … Michael Norris starts seventh in the 30-lapper after placing a close second to Richards in the first heat. The Pennsylvanian took the green flag from the pole position in the prelim but was outgunned by Richards on an original start that he didn’t agree with. “I don’t really think the leader started that race,” Norris said. “But I feel like we have a good car. I felt a lot better after the heat than I did in qualifying.” … Chub Frank’s night went south quickly when he failed to log a qualifying lap due to a broken drive flange. The problem came after his crew had to hustle to replace his car’s rearend because trouble was discovered when they checked the rear axle upon unloading in the Volusia’s pit area. … G.R. Smith slowed during his B-main with smoke wafting from his machine; he later announced on Facebook his Speedweeks was over. First B-main (top three transfer): Ricky Weiss, Don O’Neal, Brandon Overton, Brian Shirley, Colton Flinner, Donald McIntosh, Dennis Erb Jr., Ivedent Lloyd Jr., Frank Heckenast Jr., Blake Spencer, Chub Frank, Blair Nothdurft, Tyler Clem, Mike Hammerle. Second B-main (top three transfer): Scott Bloomquist, Kent Robinson, Tyler Bruening, Jason Jameson, Dan Stone, Brent Larson, Stacy Boles, Jason Fitzgerald, Jeff Mathews, Steve Isenberg, G.R. Smith. Scratched: Hillard Miller. Row 3: Colton Flinner, Dennis Erb Jr.
Row 4: Donald McIntosh, Frank Heckenast Jr.
Row 6: Blair Nothdurfth, Ivedent Lloyd Jr.
Polesitter Chris Madden of Gray Court, S.C., pulled away at the start and led all eight laps to win the fourth heat. Madden’s only serious challenge came as he worked lap seven when eventual runner-up Brandon Sheppard closed to within a length as they raced into turn three. Madden turned back the charge and won by .699 of a second, while Sheppard settled for second ahead of Darrell Lanigan and Dale McDowell. Finish (top 4 transfer): Chris Madden, Brandon Sheppard, Darrell Lanigan, Dale McDowell, Tyler Bruening, Kent Robinson, Scott Bloomquist, Jason Jameson, Steve Isenberg. Scratched: Dillard Miller. Josh Richards of Shinnston, W.Va., led flag-to-flag to win the caution-free third heat. Richards beat polesitter Michael Norris into turn one on the start and led all eight laps. Norris fell behind after a poor start, but rallied to close to within a length on the final lap. His final challenge as they lead duo exited turn four fell just short at the checkers. Tim McCeadie finished third, with Devin Moran fourth. Finish (top 4 transfer): Josh Richards, Michael Norris, Tim McCreadie, Devin Moran, G.R. Smith, Jason Fitzgerald, Jeff Mathews, Stacy Boles, Dan Stone, Brent Larson. Taking the lead from polesitter Kyle Bronson on lap three, Mike Marlar of Winfield, Tenn., won the second head. Marlar grabbed the lead and eased away to win by .882 seconds. Bronson held on to finish second, with Shane Clanton third and Kyle Hardy fourth. Finish (top 4 transfer): Mike Marlar, Kyle Bronson, Shane Clanton, Kyle Hardy, Brandon Overton, Brian Shirley, Dennis Erb Jr., Frank Heckenast Jr., Chub Frank, Ivedent Lloyd Jr., Mike Hammerle. Chase Junghans of Manhattan, Kan., grabbed the lead from Cade Dillard when Dillard ran up the hill in turns one and two on the second lap and led the remaining seven circuits to win the first heat of the 2019 DIRTcar Winternationals. Junghans held off an early charge from Tanner English as English settled for second. Dillard, who lead the opening lap, slid back to third, while Boom Briggs finished fourth to grab the final transfer spot. Finish (top 4 transfer): Chase Junghans, Tanner English, Cade Dillard, Boom Briggs, Ricky Weiss, Don O’Neal, Colton Flinner, Donald McIntosh, Blake Spencer, Blair Nothdurfth. Scratched: Tyler Clem. Six nights of Dirt Late Model racing at Volusia Speedway Park begin on a warm (80 degrees) and sunny day with 42 cars signed in for DIRTcar-sanctioned competition. … Rain that washed out Sunday night’s World of Outlaws Nos Energy Drinks Sprint Car Series finale at Volusia left the pit area very soft, prompting officials to delay parking Dirt Late Model teams until Monday afternoon. Nevertheless, some spongy spots in the pits still proved problematic; World of Outlaws Morton Buildings Late Model Series rookie candidate Ricky Weiss of Headingley, Manitoba, was one driver who had his trailer’s rear tires sink in the muck, necessitating a tow. … Several additional teams are on the grounds but not racing in the opener, including Jonathan Davenport, Jimmy Owens, Hudson O’Neal, Earl Pearson Jr., Tyler Erb (he plans to start on Wednesday driving a No. 91 fielded by Georgian Steven Roberts), Gregg Satterlee (he’s flying back to Florida to meet his team and run Volusia’s final three shows) and Morgan Bagley (he’s spending the night installing a fresh engine that Chase Junghans picked up for him at Clements’s shop in South Carolina and brought to Volusia). … Reigning WoO champion Mike Marlar of Winfield, Tenn., is entered in the K&L Rumley No. 6. … Devin Moran of Dresden, Ohio, is making his return to the No. 9 fielded by fellow Ohioan Tye Twarog for Volusia’s action after making his first eight starts of Speedweeks — all in Lucas Oil Late Model Dirt Series events — in his new full-time ride with Dunn Benson Motorsports. The 24-year-old is running selected non-Lucas Oil shows with Twarog, Moran’s car owner for the last two years. … Donald McIntosh of Dawsonville, Ga., is running a plain yellow Blount Motorsports that hasn’t been wrapped in his second career Super Late Model appearance at Volusia. He previously competed in the DIRTcar Nationals two years ago. … Hot off a runner-up finish in Saturday night’s WoO 50-lapper at Screven Motor Speedway in Sylvania, Ga., WoO rookie contender Kyle Hardy of Stephens City, Va., is making his Volusia debut. The 25-year-old has visited the track twice previously with his parents — once when he was still in diapers and again in 2004. … Other notable first-time Volusia competitors are Tanner English of Benton, Ky., who has seen racing at the track in the past while assisting his father Terry’s efforts, and WoO rookie Cade Dillard of Robeline, La. … WoO Sprint Car star Donny Schatz is once again sticking around to enter his own Dirt Late Model in the week’s events. … Boom Briggs of Bear Lake, Pa., is debuting a new Club 29 Race Car. He said it’s car No. 1 to come off the new jig in Club 29 builder Darrell Lanigan’s shop in Union, Ky.; Lanigan’s own machine is car No. 3 off the jig. … Mike Benedum of Salem, W.Va., is a spectator in Volusia’s pit area after an accident Saturday night at East Bay Raceway Park in Gibsonton, Fla., that twisted the front end of his car prompted him to bring an early end to his Speedweeks racing. The opening night of Volusia’s six-night DIRTcar Nationals features a 30-lap DIRTcar-sanctioned event paying $7,000-to-win. 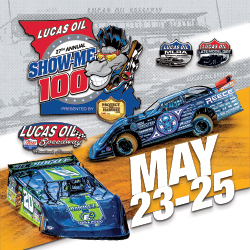 One more evening of DIRTcar action will follow before the World of Outlaws Morton Buildings Late Model Series takes the spotlight Wednesday through Saturday nights. Tyler Erb of New Waverly, Texas, and Jonathan Davenport of Blairsville, Ga., have each won three features during this Georgia-Florida Speedweeks. Other winners after 10 total events include Earl Pearson Jr. of Jacksonville, Fla., Hudson O'Neal of Martinsville, Ind., Brandon Overton of Evans, Ga., and Shane Clanton of Zebulon, Ga. Davenport was the lone winner in DIRTcar-sanctioned action at Volusia last year, as one of the two DIRtcar features was lost to Mother Nature. Monday’s program includes group qualifying, four heat races (transferring four from each), four B-Mains and the 30-lap headliner. Group qualifying by heat races will be utilized; heats will be aligned straightup and the heat winners will redraw for the feature's first three rows. 3 p.m.: Pit area secured; pit passes required after 3 p.m.